An observation satellite launched on Thursday by China to monitor carbon dioxide levels in Earth's atmosphere aims to provide a clearer picture of whether countries' efforts to cut emissions are working. "The satellite will keep a clear record of CO2 emissions and absorption in different countries," said Li Jiahong, chief engineer of China's National Remote Sensing Center. "It will also identify emissions sources with higher efficiency than traditional measures. "This will give us a bigger global voice on climate change issues as well as influence in the thriving global emissions trading market," Li said. The satellite, which was launched from the Jiuquan Satellite Launch Center in Northwest China at 3:22 am, will measure CO2 levels every 16 days. CO2 is one of the main gases that trap heat near the surface of Earth and result in the greenhouse effect. "Although CO2 is the major greenhouse gas to be blamed for global warming, it constitutes only a tiny part of Earth's atmosphere. 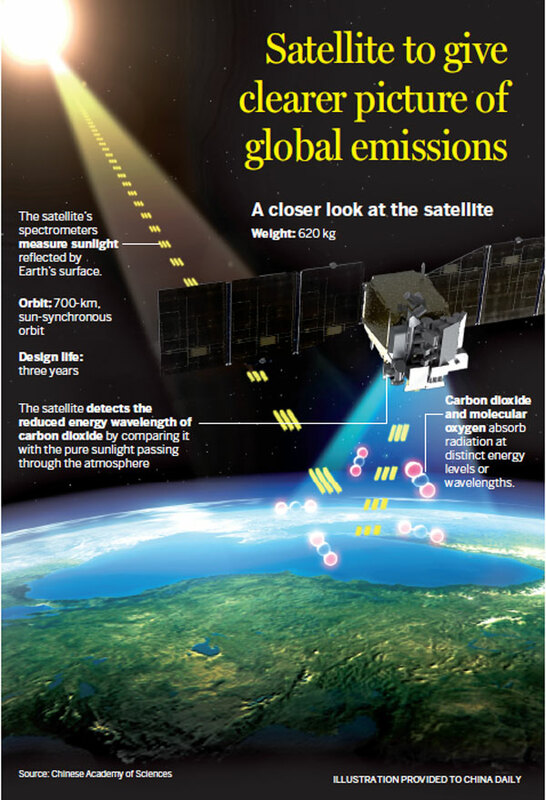 It's very difficult to precisely measure the levels," said Yang Zhongdong, a researcher at the China Meteorological Administration and chief designer of the satellite's ground application system. Atmospheric concentrations of CO2 have increased by 40 percent since the Industrial Revolution. The carbon emissions data used for negotiations at international climate summits are based on statistics including fossil fuel usage and economic development. "Despite being widely used, the data have many uncertainties, such as CO2 emissions brought about by fossil fuels," Yang said. "Satellite observation from space, on the other hand, can effectively reduce the uncertainty and provide more accurate data." Currently, there are two carbon satellites in use: the United States' Orbiting Carbon Observatory-2, which was launched in 2014, and one launched by Japan in 2009. "Although data gathered by the existing satellites is shared among climate researchers worldwide, our scientists will still benefit a lot from more information provided with firsthand material from our own satellite," said Yin Zengshan, the Chinese satellite's chief designer. "We're taking a technology route similar to NASA's OCO-2. However, since our carbon satellite is a latecomer, we managed to overcome some deficiencies of the OCO-2 and get better signal intensity," said Yin, who is a researcher at the Shanghai Engineering Center for Microsatellites affiliated with the Chinese Academy of Sciences. In May, NASA announced that it is building OCO-3, a more powerful instrument that will be installed on the International Space Station. Japan and the European Union have also announced plans for space observation of CO2. "The current three satellites of China, the US and Japan are far from enough in terms of observing quantity and coverage. More satellites will be needed after observing techniques are tested via these projects," said Yang at the China Meteorological Administration. He said CO2 observation technology will also be installed on China's Fengyun 3 meteorological satellites and the Gaofen high-resolution Earth observation satellites.